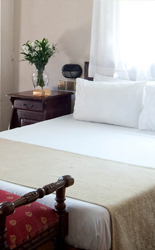 Sun Aviv Hotel located is in the center of the Tel Aviv`s business area, next to the charming neighborhood Neve Tzedek. The hotel, decorated with the small hotels of the European capitals in mind, offers accommodation and leisure in Tel Aviv with comfortable prices. We are walking distance from the Susan Dalal center, the small boutique shops on Shabazi st., the Carmel Market, Rothschild Blvd and the Nachalat Binyamin outdoor mall. In our clean and spacious rooms you will find a/c, TV, mini-bar and safe. Sun Aviv Hotel offers a continental breakfast to your room or at our cafeteria located at the entrance floor. During the day cold and hot drinks may be ordered to the room. Our reception is open 24 hrs and our staff will gladly recommend places to see in the area. The beach and the old city of Jaffa, both within walking distance, will make your vacation complete. Sun Aviv invites you to enjoy your holiday with us. © Designed by Bytech Ltd.